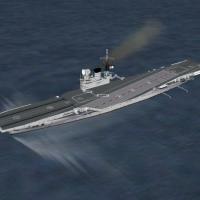 This is the aircraft carrier HMS Victorious as she appeared "post 1950s refit" until her retirement in the late 1960s. Originally released for 1stGens way back in 2005 and subsequently "lost" in the ether. Prompted by one of the CA members into looking for it, I scrounged through all my archive CDs (dating back to 2004) and actually located it. This will give our Fleet Air Arm guys someplace new to land on! Some very small tweeks for SF2 (mostly to the radar statments for TEWS -but as she 'retired' in 1969, that's a bit moot). As CVs are 'unvulnerable' in-game, her defensive armament is minimal (the same 2 guns that Hinch put on way back when), and mostly for show. different map and using Royal Navy equipment. As always, READ the enclosed readme for fully detailed, easy-to-follow install instructions. Hinch's original readme is included, for historical reference purposes. With thanks to Hinch for creating this, so long ago!